For many years I have been building model battleships. One of the problems I have encountered is how to realistically turn the turrets. Over the years I have built many gearboxes to do this, some of which worked okay, others could be heard grinding slowly from the other side of the pond. Collectively I have a large box of various gears available, but none of my attempts were really successful. An obvious solution would be to modify a servo to turn twice as far and to slow it down. On discussing this with a friend who maws into electronics he advised that the feedback potentiometer in the servo was matched to the circuits, so changing this for a different value, to give more degrees of rotation would not work, also the speed would still be too high. I took a servo apart and studied the makeup, and further though suggested that if the feedback potentiometer was removed and wired in on a longer lead, and then fitted to an extended gear chain attached to the original servo then this should work. 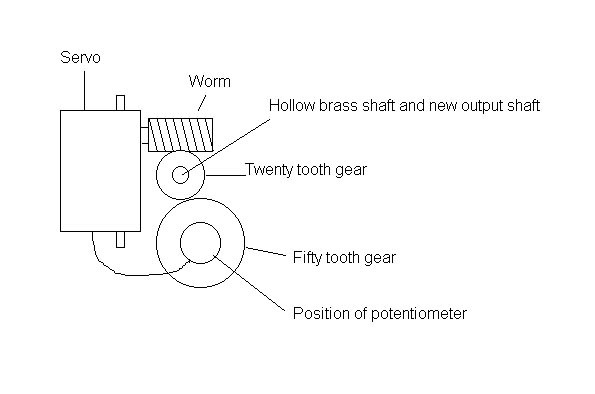 1) Cut away any physical limiting lugs in the existing servo gear train to allow continuous rotation. 3) reassembled the servo, and checked its working. Without the potentiometer working you now have a speed controlled gearbox able to rotate in either direction. 4) I then extended the gear chain and linked the potentiometer back into the gear chain, but with a two to one reduction. 5) This gave me a powerful servo with self-centering motion able to rotate some 95 degrees in either direction. In practice I found that it was not possible to get an exact gear match for two to one rotation. The arrangement below gave me about 190 degrees rotation. On systems which have servo throw adjustment its no problem to alter the setting an get the exact angle required. On my system I constructed a plastic gate and stuck it on the transmitter to physically limit the amount of joystick movement to produce a total of 180 degree movement. This system works extremely well and if several servos are linked in this was multiple turrets will work in unison. A little thought will show the direction of rotation needs to be reversed for a forward/aft turret arrangement, and this is achieved by linking the fifty tooth gear direct to the worm gear. This system retains the efficiency/reliability of modern servos and ease of operation. It can also be used to move cranes or anything else on a model where a specific degree or movement patten is required with a "return to base" setting. As to speed of rotation, at 1/96 scale its ideal for turning gun turrets. As a further bonus the electronic circuitry in a servo operates to slow the servo movement down just before it reaches the desired position, which in practice means the first and last 5 degrees of rotation mean the turret creeps into its final position which is very realistic indeed!